In a very short period of time, protein deficiencies cause our bodies to malfunction and we begin experiencing the symptoms of disease. Did you know that 9 out of 10 people lack the proper amount of protein in their systems in order for their bodies to function properly? Contrary to popular belief, a sufficient intake of protein in the diet does not ensure that the body is getting what it needs. The trouble stems from the body’s inability to properly digest dietary protein and manufacture systemic proteins which keep our bodies intact. Even though you may be eating a sufficient amount of protein, it does not mean that your body is utilizing it. When our dietary proteins are consumed in the proper amount and balance, as well as properly digested, our bodies will create systemic proteins. When our diet is lacking in this essential nutrient, our pancreas will stop creating the enzymes for proper digestion, and our body will become unable to manufacture much needed systemic protein. In a very short period of time this deficiency will cause our bodies to malfunction and we will begin experiencing the symptoms of disease. Platinum Plus Amino Acids Formula is a complete combination of essential amino acids -- amino acids the body cannot make, and must get from food sources. SuperNutrient Corporation's research has found that 9 out of 10 people are protein deficient as a result of improper digestion of dietary protein. Protein is throughout our body, providing structure, function, and organization. It is in our skin, nails and hair. It is in our blood, lymph, and plasma. It enables our muscles to contract. It provides integrity to the walls of our intestines. It fights infection in our body and repairs any tissue damage that occurs. It is in our bone and brain cells. It makes the enzymes that digest our food, repair damaged DNA, and regulate all chemical reactions in our body. It forms lung cells. It carries oxygen to cells. It removes toxins from the liver. It makes up all neurotransmitters except one. It maintains a proper pressure differential between the fluid inside and outside of our cells. It makes 95 percent of all hormones in the body as well as carrying hormones, vitamins, fatty acids and minerals to the cells. The list goes on and on. The point is that when we talk about protein we are not talking about a part of the system, we are talking about the system itself. When we assimilate protein into the system daily, we are keeping the entire system intact. When we are protein deficient, we will begin to miss pieces of our system resulting in systemic malfunction. It would be as if the foundation of your house started to degrade and so the walls cracked. Then the roof tiles started to degrade and so the rain came in and rotted floor. Then the insulation degraded and the unprotected wiring inside shorted out and set the rest of your unstable, rotting house on fire! Luckily the materials comprising your house are pretty stable and last for years before degrading. Protein, however, is not stable, it is constantly being used up and exchanged for new protein in a process called "protein turnover." About one pound of protein a day is used up in this process, and so it needs to be replenished from the diet on a daily basis. In one year all the protein in our body has turned over. When dietary protein is consumed in a healthy system it is broken down by stomach acid and pancreatic enzymes into amino acids, (the molecules from which protein is made) absorbed through the small intestine, and made available to the body for systemic protein production. Literally thousands of different kinds of proteins are being manufactured constantly in our body from 20 different amino acids. The body can make 10 of these, and 10 are considered "essential", meaning they must be acquired from the diet. What Happens If You Don't Get The Proper Amino Acids? Amino acids must be present in the body in the sufficient quantity and proper ratio to one another in order for protein production to properly occur. Research is finding consistently, that when amino acids are low, missing or out of balance, the body will begin to malfunction. This malfunction starts with the digestive system. Poor diet as well as certain illnesses (such as alcoholism and hepatitis) cause amino acid deficiency due to pancreatic malfunction because, when the pancreas can not make digestive enzymes (remember these are made from amino acids) in sufficient quantity, dietary protein will not be broken down sufficiently to be used by the body for systemic protein production. Lack of systemic protein means the liver will start clogging with toxins, wounds will heal more and more slowly and blood sugars will be less stable. 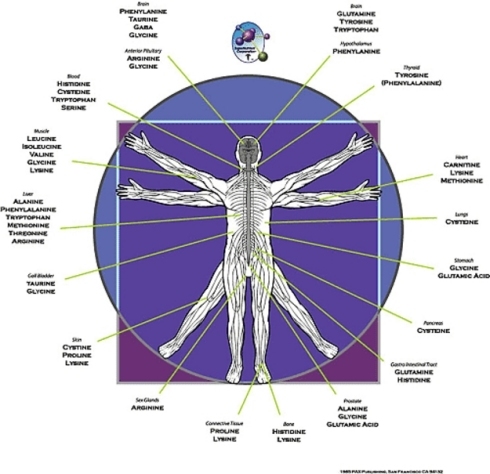 Mineral and vitamin deficiencies occur, hormones become unbalanced. The brain will cease making enough of certain important chemicals leading to mood disorders, hyperactivity, attention deficit, and depression. Immune system proteins become low diminishing the work of antioxidants, leaving the body prey to viral and bacterial infection. Can't we get these proteins from our food? Can the amino acids that are contained in SuperNutirents Platinum Plus Essential Amino Acids be obtained from the food that we eat? The nutrition that we get from our food is no longer sufficient for our needs. By "improving" foods with cooking and preserving, pasteurization of dairy and juice products, and canning, we really haven't improved anything. We can keep it forever now but the trouble is that it has become "dead" food! The enzymes present in live food are destroyed in our preparation of them. These enzymes according to Dr. Edward Howell and Dr. Howard Loomis augment our "enzyme banks" (a limited capacity to make digestive enzymes) because LIVE FOOD HELPS TO DIGEST ITSELF! It is for this reason that Dr. Vickery recommends that everyone make an effort to ingest at least 50% of their food in its natural state. The average person typically does not do this much. Even with this effort it is necessary to supplement a healthy diet with SuperNutrient's Amino Acid formula. This supplement provide proportionate amounts of amino acids to the pancreas and small intestine which then manufacture the digestive enzymes needed to digest the daily dietary protein we ingest. The body then gets the total amino acids from the meat, eggs, fish, and nuts that should be part of our daily diets. How Can You Keep This From Happening? Dr. Vickery's Platinum Plus Amino Acids are a balanced blend of amino acids. When Platinum Plus Amino Acids enter the body and move through the stomach, immediate production of systemic protein begins. Pancreatic cells churn out digestive enzymes, which properly break down foods into more amino acids. Amino acids are then carried all over the body to produce the thousands of proteins necessary to sustain the structure and function of our body. In a well functioning system the body will not over produce any of the 10 non-essential amino acids. The amino acid production process has a built in mechanism to keep this from occurring. The 10 essential amino acids in Platinum Plus Amino Acids are combined in a balanced blend to encourage optimal amino acid activity in the system. 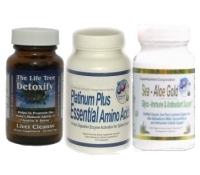 The Vickerys' clinical studies have consistently found that a well balanced diet supplemented with Platinum Plus Amino Acids will maintain a healthy system and revitalize a diseased one. This formula is a combination of essential amino acids based on the formula of the egg, a complete protein. The formula provides proportionate amounts of amino acids to the pancreas and small intestine which then manufacture the digestive enzymes needed to digest the daily dietary protein we ingest. The body can then extract the total protein from the meat, eggs, fish, and nuts that should be part of our daily diets. Similar to the daily diet, the vitamins you purchase for health and healing are absorbed more completely when taken in conjunction with the Patented Amino Acid Formula. This perfectly balanced Amino Acid helps the body to properly utilize vitamins and supplements. With the proper regimen of vitamins, amino acids and other important supplements, it is possible to maintain health as well as fight disease and chronic illness, naturally. 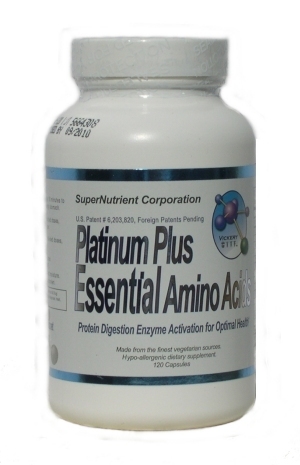 Platinum Plus Essential Amino Acids are free-form, single amino acids that do not need to be digested, allowing the body to immediately create usable systemic proteins. This perfectly blended formula works consistently and over the long term, traits that other protein and amino acid supplements do not have. Within twelve hours of taking these amino acids, spinal disks begin to regenerate. Look for high quality, crystalline, FREE-FORM, amino acids. 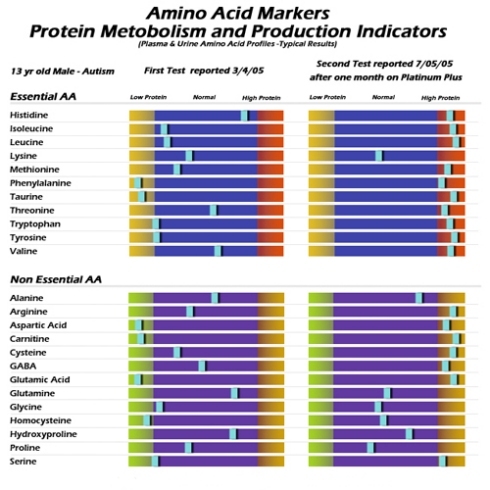 Most amino acid blends on the market are actually reduced milk or soy proteins which must first be broken down into single amino acids by the digestive process in order for the body to create usable syemic proteins. Free-form amino acids are single amino acids, which need no digestion and are ready to form all the enzymes needed for optimal food digestion. Platinum Plus Essential Amino Acids, derived from vegetable and biological sources such as potatoes, beets, sugar cane etc., and no animal proteins, are the highest quality, professional grade, free-form amino acids - absolutely guaranteed. Look for a PROPERLY BALANCED blend of essential amino acids. Even if the amino acids are professional grade free-form amino acids, they will stop benefiting the body after a short time, if they are not properly balanced. Most amino acid formulas on the market are ineffective after 3-6 months. Look for added SULFUR and MOLYBDENUM to support the liver. When the body begins to heal, it rids itself of the toxins, bacteria, viruses and metals that have been stored in the tissues. All these things are filtered through the liver on their way out of the body. 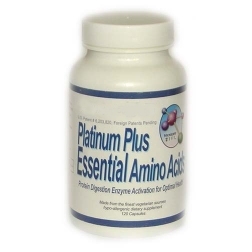 Platinum Plus Essential Amino Acids have the extra sulfur and molybdenum to ensure the liver has the help it needs to remove toxins from the body. "I have been on your program for four months now and I can certainly see the difference! Last year I was crying every day due to lack of sleep, pain, depression and anxiety. This year I had little to no pain, no depression , no anxiety and got good sleep. Thank you for talking to me when I need to. Thank you for caring about us. My husband also sends his thanks because he doesn't have to rub my back every day as he has for the past five years." "In April of this year, I woke up with such severe back pain, I could hardly get up from the bed, chair, or even stand up. Even after taking Advil (extra strength) , it did not alleviate the stabbing pain. I went to my old chiropractor and after an hour a day each week of being worked on, I was still in pain. This continued for many weeks and needless to say, was very scary. After approximately only 2 weeks on the Platinum Plus, the pain started going away and has not returned since. Anyone that is afflicted with back pain should definitely take Platinum Plus!" "My friends and family kept asking me what I wanted for my birthday and I kept saying, I just want to be well... I would like to be free of pain and to have my life back. That was all I wanted... and you Dr. Vickery gave that gift to me. I am now depression and anxiety free! I have mental clarity where there was only fog. I am headache/migraine free!!! And my neck, shoulders, hips, elbows, arms, and legs... PAIN FREE!!!" "Your amino acids have made my mother's life bearable again. My poor mother has endured unbearable pain from her arthritis for many, many years. I don't want to sound exaggerating, but it is true... She is like a new woman. Her pains have subsided. Your product has really helped my mother." In 1982, Dr. Vickery, a Holistic Chiropractic Physician and Applied Kinesiologist, discovered that cellular protein deficiency had a deleterious effect on the spine. In the mid-1980's Dr. Vickery and a team of world renowned doctors and chemists began work to develop a perfectly balanced free-form amino chain similar to that found in nature. By 1986, Dr. Vickery's first 'Essential Amino Acid' perfectly balanced formula was in use. In 1997, the SuperNutrient Corporation was founded with Dr. Vickery as its Chief Medical Director. 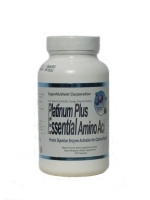 Since then, the SuperNutrient Corporation has released its Platinum Plus Essential Amino Acid Formula. No other supplement does all of the functions that Platinum Plus Essential Amino Acids has proven to do! 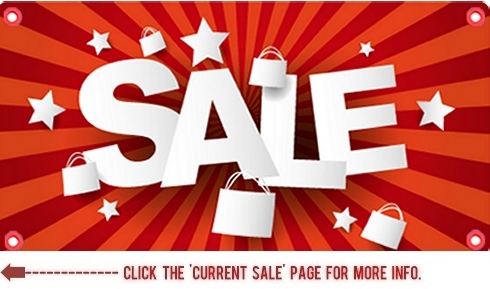 Click to add Platinum Plus Essential Amino Acids to shopping cart! Adults, take 4 to 6 capsules per day. Platinum Plus: A complete combination of essential amino acids for vibrant health. 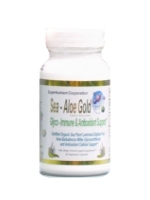 Sea-Aloe Gold: Helps provide an incredible boost to your body's healing processes. The complete combination of all of the building block essential amino acids --- including the ones the body cannot make and must get from food sources. This deficiency along with a toxic liver is the definitive recipe for disease symptoms and degenerative health. Sea-Aloe Gold then follows up and helps assist your body to boost its natural healing processes to encourage rapid restoration and optimal health. 1 x Sea-Aloe Gold - Boost Your Healing Process. 30-Day Essential Body Repair & Restore.